If you’ve been following me for a while, you know that I LOVE wine. 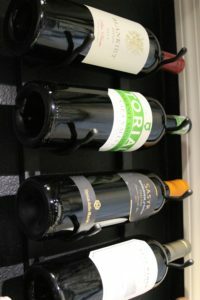 I got into it during my senior year in college, and through the years I’ve really enjoyed studying the different kinds of wines, regions they are from and most recently, I’ve been learning more about the families that run the vineyards. One of the issues in the new house was a lack of space for wine storage. We have a wine fridge that will hold about 25 bottles, but I didn’t want to store my Cabs in there. So I had to figure out a plan. We have a small storage closet under our staircase that I’d been storing our vacuum, mops and brooms in. Then one day last year I opened it, and discovered that this closet was also the space that the cleaners had been using to store ALL of the items they weren’t sure where to place! What a mess! 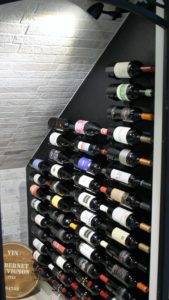 That’s when I decided that we would make better use of this space, and turn it into a wine cellar! I started by researching Pinterest for inspo. 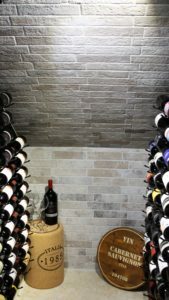 There were tons of ideas for “wine cellars under stairs” on Pinterest, but this was my favorite because it resembled the size of my closet and the look I wanted to achieve. Time to get to work! The first thing I did was design a beautiful door. 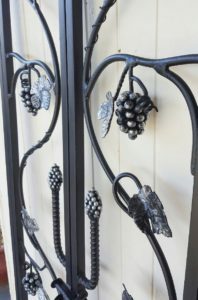 The closet is located between my kitchen and dining room, so I wanted a beautiful iron door that would show well from those areas. 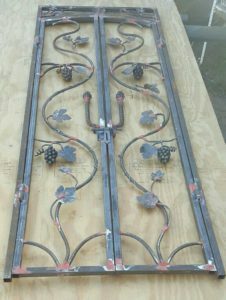 I found a fabricator to build it for me, and he did a lovely job. 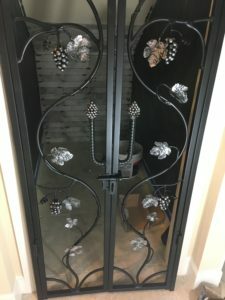 Check out the stages of the door. 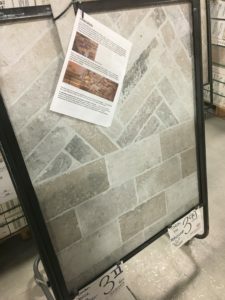 I wanted an exposed brick look, but I didn’t want too much red, because I knew the wine display walls would be dark, so I went with a grey tone, that we got from Tile Outlets of America. 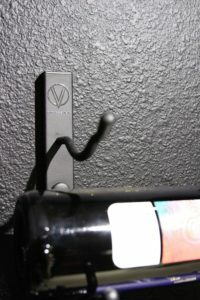 The next part of the project was deciding how to display the wine. 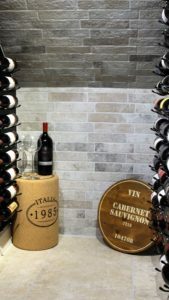 I originally wanted to display the wine on one wall in wood crates, but that would have eaten up too much space, so I had to display them the same way they lay in the inspo pic from Pinterest. 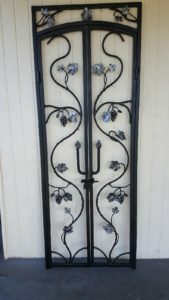 I ordered the VintageView Satin Black metal wine racks from Wine Racks of America. They were very helpful in helping me measure the space properly, and gave me tips on how far apart each rack should be installed. I really loved working with them, and would highly recommend them to anyone who asks. And I was also very pleased with the actual racks as well. They are both sturdy and beautiful. 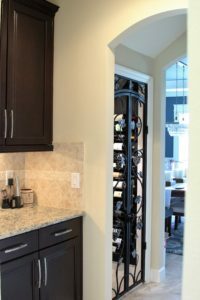 The wall on the right holds 4 cases of wine, and the wall on the left holds 3 cases. I’m currently displaying my higher end wines on one wall, and my everyday wines on the other. I painted the walls with black chalk paint. The idea was to be able to write notes next to the bottles if I wanted to, but I haven’t actually tried it yet. Finally, my husband installed adjustable track lighting so that I could move the lights around if I needed to. 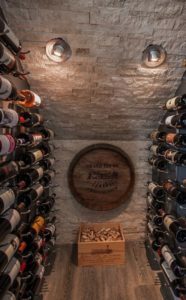 They create a warm ambience in the cellar, and great light exposure to the bottles in the back. To finish things off, I styled the area with a cork stool and a really cute wooden tray, both of which I found at Homegoods. Overall, I’m so pleased with this new space I could just scream! The pictures don’t really do it justice…it’s just beautiful, especially at night.